Most boat owners who have had their craft for any length of time will have made what they consider are ‘improvements’. If the boat changes hands the new owner will scratch his/her head and think ‘what on earth did they do that for?’. 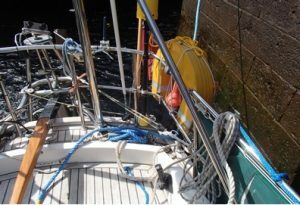 In this article I will try and set out the alterations made to my own boat, a Vancouver 28. Perhaps some of these changes will help the reader make his/her own ‘improvements’. The original drop-leaf table in the saloon has been replaced by a cockpit table which sits on a post bracketed to the side of the starboard bunk. The original table has been kept in store in case a future owner wishes to reinstate the traditional table. A previous owner made an extension to widen the starboard bunk for sleeping. This is a length of 18mm ply shaped to fit the space between the bunk and mast post. You can see the small wood block on the post and the trim on the side of the bunk that supports this extension. A cushion shaped to fit the infill completes the extension. This is placed at the back of the starboard seat when not being used for sleeping. 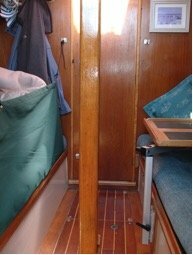 The ply itself stows under the bunk cushion when not in use. A memory foam topper which is rolled into a cushion/bolster by day adds to bunk comfort at night! On the door to the toilet is a magnetic cupboard catch to prevent it swinging when open. 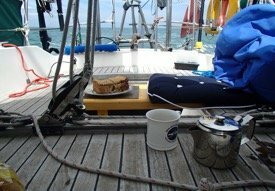 A number of nights each season are spent at anchor or secured to a mooring buoy. The inflatable dinghy is stored in the port locker. 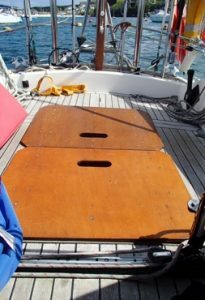 Boards have been made which cover the cockpit well and make a useful platform for inflating the dinghy. The size of the boards allows them to be stowed in the port locker as well. Recently I have taken to using a gybe preventer to haul the boom outboard when the deck is being used, in order to avoid a bruised head. 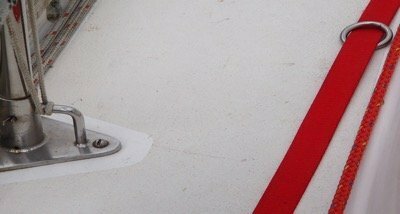 25 mm s/s tube guard rails have been added to the sides of the cockpit port and starboard.  Initially this was only done on the starboard side, in order to facilitate launching the dinghy over the rail. 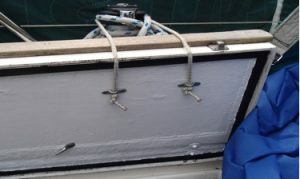 However the extra security and safe handhold this provided encouraged me to add a solid rail to the port side as well. The stainless steel rails have lugs welded at each end. These are bolted to lugs added to the pushpit and top of the aft stanchion. A gallows was designed to carry the radar and solar panel. The posts are secured to the pushpit and have diagonal supports bolted to deck fittings. Onto the posts have been welded s/s eyes to which a davit arm can be attached. 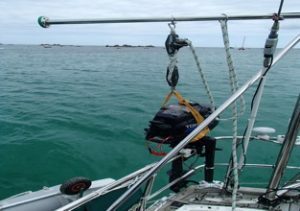 Using a mainsheet purchase, bought cheaply at a boat jumble, the outboard can be lowered onto the stern of the dinghy. The purchase is shackled to a ring which slides along the davit arm. The diagonal supports for the gallows make another handhold for the cockpit. These end in a bowline which is attached by a snap shackle to a line secured to the boom. 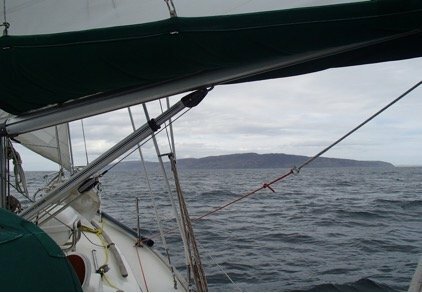 It is not necessary to leave the cockpit to rig the line. The ‘boom line’ is the correct length for clipping the snap shackle to the vang fitting when not in use. The preventer line runs to a lead block shackled to a stanchion base and then back to a cleat on the cockpit coaming. When the preventer is not in use the bowline loop (the blue line here) is hooked onto a fitting on the solid guard rail. This keeps the line clear of the side deck. I prefer webbing jackstays that lie flat on the deck and don’t present a tripping hazard. Clipping onto these can be difficult. Incorporating a s/s ring for the lifeline to be clipped on to makes life easier for me. Horticultural gravel trays, which have a solid base, have been used as drawers inside several cupboards. 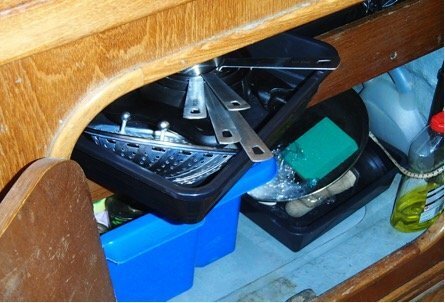 If the cupboard is extremely deep, as it is here, a second tray can be placed behind the first. The heavy duty plastic storage box holds canned goods. As well as bean bags a cockpit seat has been made using a “Stanley” toolbox as a base. A wooden top has been added. Extra timber on the base makes the box more stable. Placed on the locker top the seat makes long tricks at the tiller easier, with good visibility over the cabin. The top to the box is designed so that it can be placed in the cockpit well as a “thwart”. This can serve as a table or comfortable low cockpit seat, as shown here. A previous owner added fittings inside the locker lid to hold a length of bungee cord. This is hooked over the winch to keep the lid open. When not in use the cord is hooked onto the fitting at bottom left of the photograph. 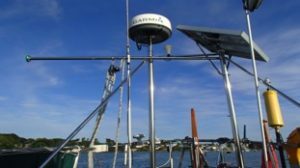 I hope this article will prompt other boat owners to come forward with ideas that they have put into use on their own boats. It could be interesting! Mike’s early career was in Outdoor Pursuits, and ended with two years work on a sail training vessel in Scotland, UK. (‘Captain Scott’). Mike then started work in the UK Merchant Navy as deckhand on a Royal Fleet Auxiliary (RFA) supply ship. Following an HND in Nautical Science at Plymouth Polytechnic he was employed as Third and Second Officer (Deck) with the RFA. After leaving the RFA in 1991 he worked on container ships, being promoted to Master with Maersk Line in 2000. After retiring in 2010 Mike renewed an interest in the magnetic compass. He was able to gain the necessary experience to take and pass the MCA Compass Adjusters Certificate in 2015. 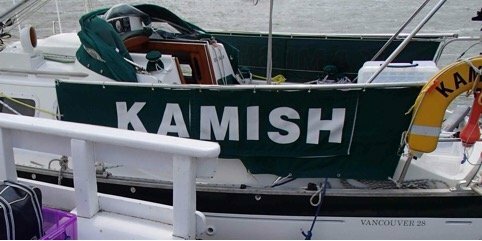 Mike used ‘Kamish’, his Vancouver 28, as accommodation in Hull for 3 months during the workshop time.